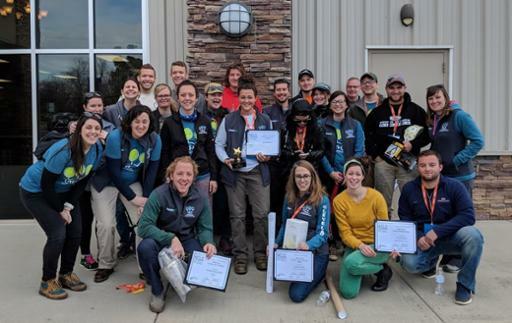 A team of students from Cuyahoga Community College (Tri-C®) placed first among community colleges and fourth overall at the National Collegiate Landscape Competition held March 14-17 in North Carolina. The 42nd annual competition attracted more than 60 of the top horticulture and landscape schools in the country. The competition challenges students in 30 individual or group events that require the expertise needed to work in the industry. McKenna Rowles of Garrettsville led Tri-C by placing third out of nearly 750 students. She finished among the Top 10 in three events — irrigation assembly (first), landscape plant installation (third) and hardscape installation (sixth). In addition, Ross Clark of Russell Township finished 12th overall for the College while posting Top 10 scores in compact excavator operation (first), truck and trailer operation (fifth) and hardscape installation (sixth). Three other Tri-C students claimed event championships. Lauren Linden of Rocky River posted the top score in computer-aided landscape design, while James Brewer of Fairview Park placed first in interior plant identification. Cole Jacobs of Bay Village teamed with Rowles to win irrigation assembly. The competition at Alamance Community College was organized by the National Association of Landscape Professionals and is a leading recruitment event for the landscape industry, where there is high demand for skilled workers. Tri-C has emerged as a powerhouse in the competition in recent years, placing fifth overall in 2017, third in 2016, 10th in 2015 and fifth in 2014.